It's like the inside of a breakfast burrito that you slice up and eat like pie. Makes one small fritatta. Serves 2-4. Rinse the cubed potatoes in cold water, pat dry. 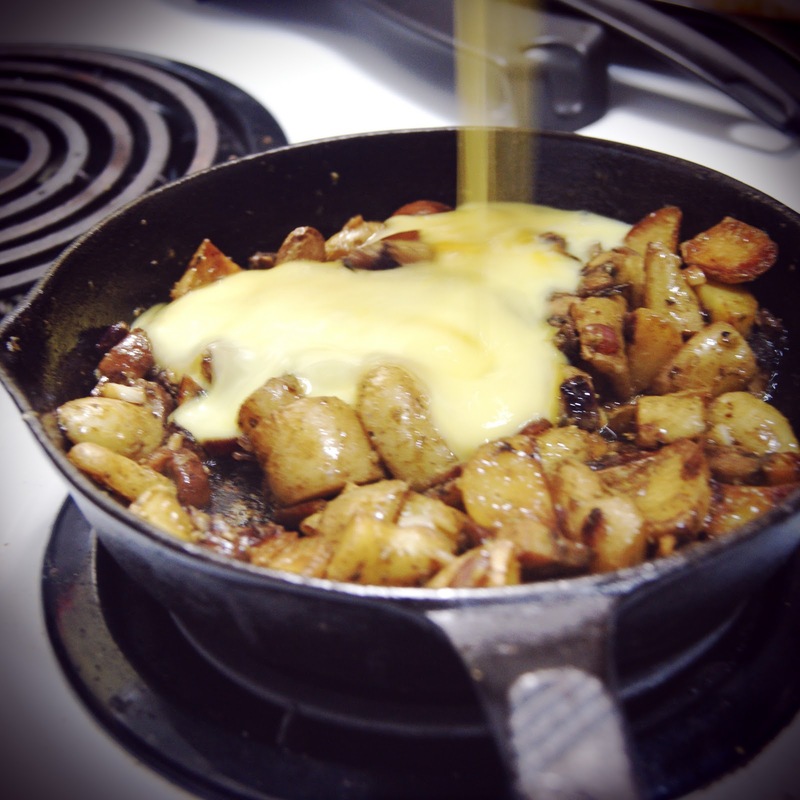 Heat skillet to med-high, when hot add 1 tbsp butter. Add potatoes once butter has melted, stir to coat. Add salt and pepper. Cover for 15 minutes, stir occasionally. Add onions, mushrooms and garlic and stir in. Continue to stir occasionally for 5 minutes. Test a potato cube by piercing with a fork to see if it is tender enough for your liking. At this point toss with the pesto, coating each cube. Meanwhile, mix eggs and milk together in a bowl. Add another dash of salt and pepper here too. 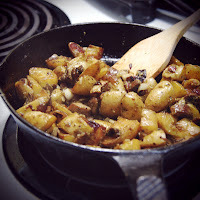 Place the other 1 tbsp butter into pan with the potatoes and let coat the bottom of the pan as best as possible. Pour the egg mixture into the pan, over the 'taters. Wait 1 minute, and then add veggies and goat cheese, sprinkling lightly over the mixture. Preheat oven to broil (light broil if it's an option). 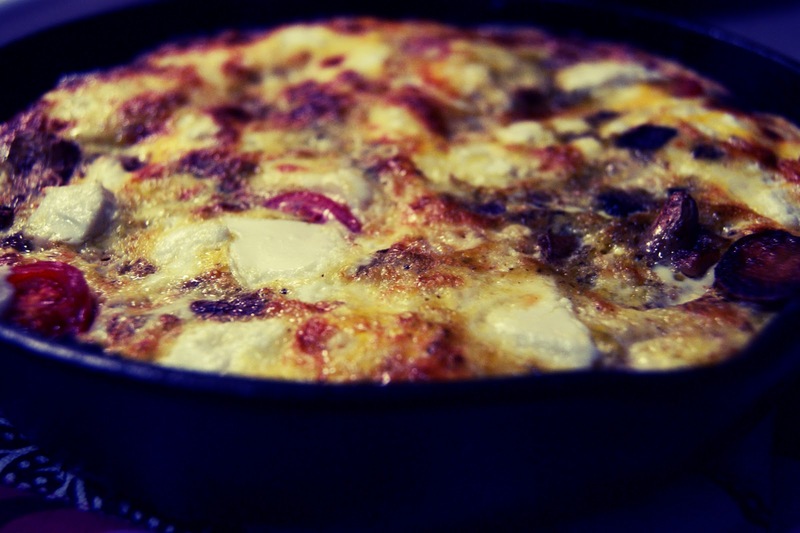 Let the frittata cook on the stovetop until the edges are cooked. 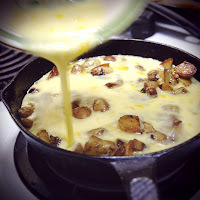 Place pan in oven for about 5 minutes to finish cooking the top of the frittata. Watch closely! Seriously, don't stray far. Keep the oven light on and park a chair in front if you have to. When eggs are firm and lightly browned on top, it's done. Try tilting the pan to make sure no runny liquid remains. Let cool for 5 minutes and then slice into quadrants and slide out with a spatula onto your plate. Voila! A vegetarian breakfast with everything you could want in one bite. Feel free to use your own fillings, add bacon/sausage, whatever your frittata-fancy may be. Yum! I've never made frittata. I think I'm going to try this. Thanks for step-by-step photos. They are very helpful.